REASON 3: Your future customers are literally around the corner, and mobile can get them in your door. In an earlier post we mentioned that 90% of users acted within 24 hours of searching for a local business on their smartphone. – A Tap-To-Call button to make it easy for users to call you. – A location map to make it easy for users to find you. This will usually be integrated with the GPS on your smartphone too. – A link to your Desktop Website should they wish to get more information that you have left off your mobile site (usually to speed up load times). – A Contact Form to enable users to easily send you an email from within your mobile site. Making the change can be easier than you think. 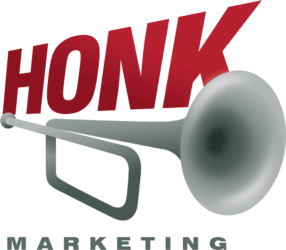 Honk Marketing is currently offering a 5 page mobile-enabled version of your current website for just $97 (valued at $497). If you would like to take advantage of this incredible offer, just click here to have us contact you with more details.